Chef Sean A. Wight’s vision of a stylish dining and social club was born in Frog Hollow Tavern. Located on the 1200 block of Broad Street, The space is a modern “Restaurant meets Bar” where a diverse crowd of people enjoy the company of others paired with a comfortable atmosphere, detailed service, and exquisite cuisine. Expect a dinner menu that features a substantial amount of local and regionally grown seasonal quality ingredients, prepared with the intention of letting the freshness speak for itself.The wine list that boasts over a hundred value driven wines has a focus on sustainable, organic, or biodynamic practices. The bar also features a diverse offering of Scotches, Cognacs, Bourbons, Vodkas, Whiskey Barrel Aged Cocktails and many great classic and seasonal cocktails, all made with fresh squeezed juices, and homemade mixes. If you would like to know more about where your food comes from visit some of these websites to learn about a few of our suppliers. Does all this sound good? Well words can only say so much. Stop by and let us show you what we mean affordable quality dining experience in downtown Augusta. Whether you’re on the hunt for the perfect local dining experience or need catering for your next event, we’re only a phone call away. 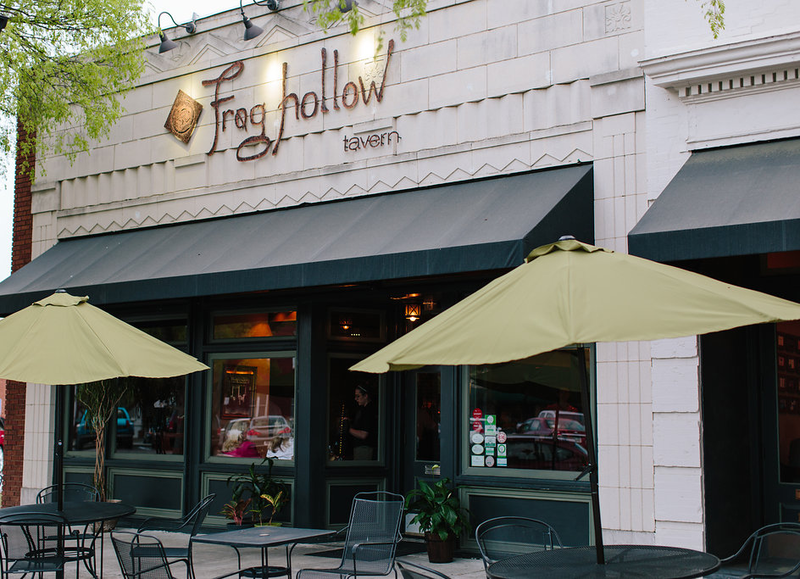 If you have any questions regarding our pricing, service, quality of dining or anything else regarding Frog Hollow we would love to hear from you.